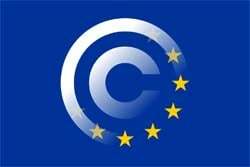 In two days time, a pivotal vote will take place in the European Parliament, one that could change the direction of copyright enforcement in the EU. Framed around the so-called "Value Gap", Article 13 aims to force Internet platforms to "play fair" on licensing rates with record labels. Ahead of the vote, hundreds of groups and organizations are facing off in a final clash of the causes. Due to unlicensed copyrighted content being made available on YouTube and similar platforms, millions of citizens around the world are able to consume the same at rates close to free. This, of course, is a situation that’s completely unacceptable to the content industries, the record labels in particular. While sites like YouTube compensate them for views of authorized content, the existence of unlicensed content uploaded by users means that the Google-owned video giant gains an unfair negotiating position, or so the claims go. Soon, however, the labels hope that the free content ride will be over. In an attempt to plug the so-called “Value Gap”, they have lobbied strongly for new legislation (Article 13) that would see user-uploaded content platforms compelled to install filters to detect infringing content before it’s even made available to the public. Two weeks ago, the Legal Affairs Committee of the Parliament (JURI) voted on Article 13. With a 15 to 10 majority, the proposal of Rapporteur Voss was adopted. This means that the plans move ahead in their current form, despite massive and persistent public outcry. This Thursday, a plenary vote on the JURI mandate will take place, so it’s no surprise that both sides of the debate are rallying to ensure that their voices are heard. 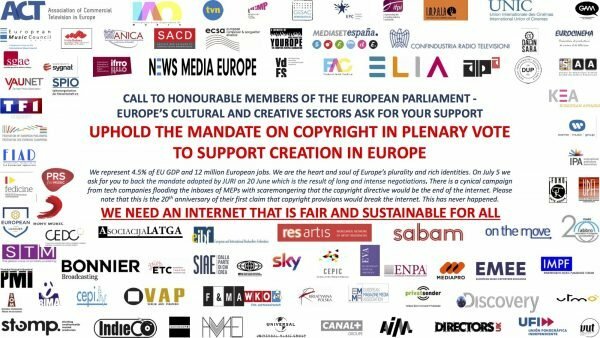 In recent days, more than 80 creative sector groups and companies called on MEPs to support their position, that “playing fair” is the only way forward. “We represent 4.5% of EU GDP and 12 million European jobs. We are the heart and soul of Europe’s plurality and rich identities. On July 5 we ask for you to back the mandate adopted by JURI on 20 June which is the result of long and intense negotiations,” they wrote. The signatories to the appeal represent countless multi-billion dollar companies whose interests will no doubt cause MEPs to sit up and listen. However, opponents of Article 13 are not sitting idly and hoping for the best. In an open letter published this week by Copybuzz, more than 145 organizations hit back, warning MEPs that Article 13 represents a serious threat to online freedom. Supported by groups including EFF, Creative Commons, COMMUNIA Association, Public Knowledge and Wikimedia, the letter highlights objections that the proposed legislation threatens innovation by making it more difficult for startups to go about their business without fear of litigation. “We represent startups which generate 9.5% of total European GDP and 2.5% of the labour market. We are the innovators that have chosen to embrace the future digital enables rather than grasp at the past. We are the believers of healthy competition, where barriers to entry should not be raised by poorly thought through regulation, to the detriment of millions of European innovators,” they write. “We represent human rights and digital rights who defend the core values of what has made the European Union’s democratic model thrive. We believe that our fundamental rights are priceless and we advocate for strong safeguards when fundamental rights are at risk, as in this case. The groups warn that Article 13 poses a threat to education and access to information and will seriously damage the capacity to improve software via hubs that develop connected products. “Because of all of the above, we urge you to vote for a public debate on the Directive and, therefore, against the negotiating mandate,” they conclude. With the vote just two days away the pressure is likely to continue, with both sides digging in. At this stage there’s only one thing they can agree on – that the imposition of upload filters will change everything. Who that will positively and negatively affect will be for history to decide.